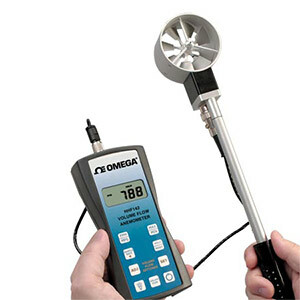 The OMEGA™ HHF142 rotating vane anemometer is a high-quality instrument providing accurate air velocity and volume flow measurements in harsh environments. The user can easily enter the size of the duct opening and the HHF142 automatically calculates the volume flow rate from the duct. The duct size is automatically stored in memory on turn-off and up to 10 unique duct sizes can be stored and recalled for frequent use. 참고: Comes with NIST certificate (3 data points), vane sensor [25 or 70 mm (1 or 2 ¾") depending on model], 3 extension rods (flexible, straight and with handle), 1.5 m (5') cable, 3 "AA" alkaline batteries, hard carrying case and operator's manual. For units with a protective boot and splash proof seals add "-PB" to the model number and $75 to the price.